You’ve just received your fresh new passport, and you crack it open for the first time to see… a mistake. Don’t worry, it can be fixed! If the US State Department made an error printing your new passport, they will make passport corrections with no government fee. This procedure is called “passport re-application.” You can also change or correct a Passport if your name has legally changed within one year of receiving your new passport. You can also qualify for this service if you were issued a temporary passport valid for one year or less and need to have it changed to a full-validity passport that is good for 10 years. This is often the result of having a lost or stolen passport replaced at a US Embassy overseas. Our guide will tell you all your need to know to apply for changes in a passport or get passport corrections made. You are eligible for a passport correction at no government fee if your passport contains a printing error, such as a misspelled name or incorrect date of birth. You will be eligible to change a limited validity passport to a 10 year passport at no government fee if your passport was issued for a validity of one year or less because it was granted on an emergency basis, such as for travel home to the United States after a passport was lost or stolen overseas. Passport Form DS-5504, completed offline or filled out online at https://pptform.state.gov/, printed and signed. One new passport photo – This must be a different photo than the one on the passport you are correcting or changing. For a passport correction, submit proof that the information was printed incorrectly, such as a copy of your birth certificate. This must be an original or a certified copy. To change the validity of a passport, submit the letter from the US Embassy or State Department that lists the documents required for you to be issued a full-validity passport, as well as all documents listed on the letter. By Mail – You can mail in your application for passport change or passport correction to the National Passport Center for processing. There are no government fees for passport corrections issued by mail at standard processing speed. 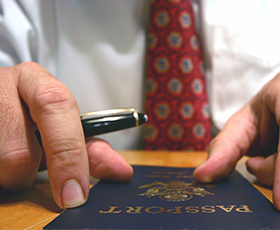 At a Passport Agency – If you need your passport fixed in a hurry, you can visit a US Passport Agency in person, where your passport correction will be processed on-site. Please note that a government fee of $60 will apply for this “expedited at agency” service. By a Passport Expediting Company – The best way to get passport corrections done fast is to send your documents to a reputable passport expediting company, who will hand-carry your application to a Passport Agency. The government expediting fee of $60 also applies to applications processed with a passport expediting company. How Long Does it Take to Change or Correct a Passport? No-fee service by mail will take up to 8 weeks. Expedited passport corrections by mail cost $60 in government fees and take 2-3 weeks to be processed. The fastest way to apply for changes in a passport or corrections is a passport is to either go to a Passport Agency in person or use the services of a passport expediting company. In order to go to a Passport Agency in person you will need to call the National Passport Information Center at 877-487-2778 to make an appointment at one of the 26 Passport Agencies nationwide. Passport expediting companies can have your passport corrected or changed in as little as 24 hours, without you having to make an appointment or appear in person anywhere.